The Promenade Stages runs on a closed road circuit on the Wirral. Organised by Wallasey MC it's a round of the ANWCC, ANCC and F1000 Stage Rally Championships. You can see a lot of cars on stage at one time including WRC's. 2 Stages on Friday night with First car at 1930hrs and a further 10 stages on Saturday with First car at 0800hrs. A total of 44 stage miles. The event is centred on the popular holiday resort of Marmaris with stages also in the Mugla region. Service will be at Asparan close to Thursday's shakedown. Rally Isle of Man takes place on the islands famous tarmac stages. It's a round of the British, RAC, MSA Historics, RAC Championships and more. There are 3 days of rallying over 18 stages and 140 stage miles. There will be two town centre stages and a stage finish at the TT Grandstand, Douglas. First car Thu 1920, Fri 0915, Sat 0900. Clare Stages Rally organised by Clare MC is a round of the National and West Coast Rally Championships. This year Clare MC are raffling 7 free entries (quite an incentive). The event is 9 stages (3x3 format) over 120 kms in a compact area near Ennis. One stage passes Father Ted's so if you see the Bishop bent over just carry on driving. First car 0930hrs. Not a WRC round this year but welcomes the European Rally Championship. Centred on the town of Mikolajki. Free practice and shakedown is at Talty. There are 15 stages on 216 kms of gravel. The Bushwacker Rally organised by Omagh Motor Club runs in County Tyrone NI. It is a round of the ANICC Stage Rally Championship. Its is a forest rally with a short section on sealed surface. 6 stages include Lough Braden and Killeter. 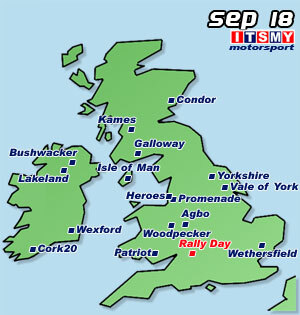 Castle Combe Rally Day takes place at Castle Combe circuit, Wiltshire. Displays including M-Sport. Car demos on circuit and meet the stars. You can buy a clubman package which includes use of the mixed surface stage for about £125-150 including marquee space and camping. East Ayrshire Car Club organise the rally at Kames Motorsport Complex. There are 16 special stages covering 20 miles. Kames is tight, tarmac and with plenty of action. Trackrod Rally Yorkshire. Based in the coastal resort of Filey with HQ/docs in the town and scrutineering at the Evron Centre. There will be 45 stage smiles (57miles for Historic Cup) using Dalby, Langdale, Cropton and Gale Rigg. There will be no double use stages. Cork 20 International rally organised by Munster Car Club. It's the final round of the Irish Tarmac Championship. The event is centred on the town of Macroom. There are 16 special stages totalling about 150miles. First car (sat) 0900hrs (1sun) 0830hrs.